Around my house there are constant sword fights, light saber wars, and lots of sound effects! My 7 year old is always the "good guy", while my 4 year old tends to gravitate towards the villians, or "bad guys", if you will. My boys have a wooden treasure chest in their room that was passed down from a family friend. It's the coolest thing! I use it to store all of their role playing items: hats, swords, sabers, gloves, masks, eye patches, and... you get the idea! 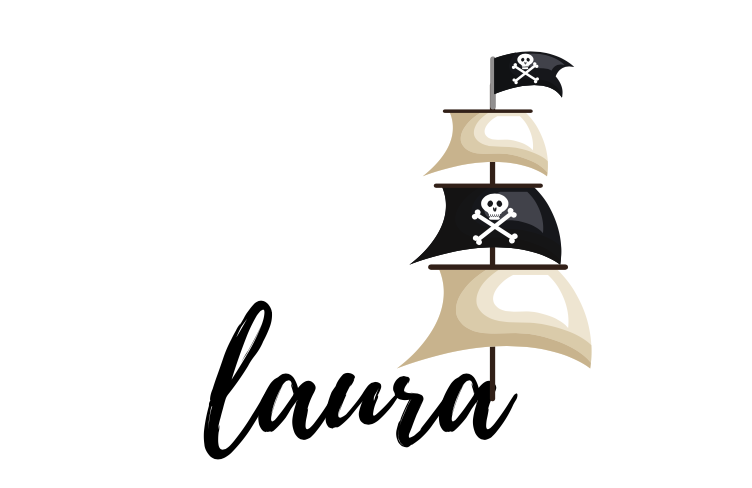 I stumbled upon the CUTEST Pirate Valentine cards from Minted, and I was instantly inspired! We love pirates and pirate parties! And because my boys are so adventurous, I knewt it would be fun to put together a Pirate themed Valentine Party! 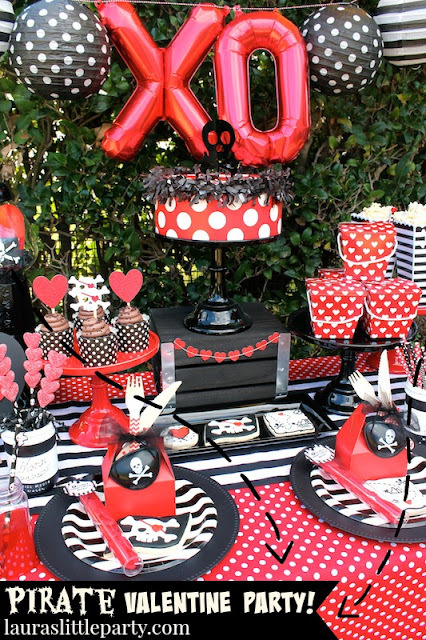 One of the great things about putting this Pirate themed Valentine Party together, was that I already had most of the decor that I kept from past parties. Red & black is an easy color palette to work with, especially when you can mix + match patterns! I loved that I didn't have to shop for much, and I also had a lot of pirate party decor left over from my littlest guy's 1st birthday party - you can see his Pirate party on the beach, here! I created a fun kid-sized party table with lots of fun decor, sweet treats, and yummy snacks. I made a couple party treats myself, such as the heart rice krispy treats, and the gummy heart kabobs. I also popped some microwave popcorn, and put it inside coordinating plastic popcorn holders. Don't you just love the glitter hearts + the pirate skull tags with the heart-shaped eye patches? I thought they were simply aaargh-dorable! My friend Blanca, from Creativities Galore created them especially for our Pirate themed Valentine Party! I'll also show you more ways I used her tags throughout our party. The krispy treat hearts and gummy kabobs were very simple to make! I took store bought rice krispy treats and stamped them into heart shapes, with a mini cookie cutter. Then, I squeezed Betty Crocker cookie icing on top, and finished them off with black sugar sprinkles. For the candy kabobs, I took gummy heart candies and stacked them on top of skull paper straws. Other than getting sticky-gooey fingers while pushing the candies onto the straws, it was a simple process and my little guys loved them! I stuck the kabobs inside of this fun painted Mason jar from Just Add Glitter By Marla! All of her jars are so amazing! I often add faux cakes to my party tables. I knew I had to create one for our Pirate themed Valentine Party! I took a styrofoam cake form from FloraCraft, and covered it with polka dotted wrapping paper. I finished it off with black tissue festooning from Shindigz, and topped it with a pirate acrylic cake topper, from The TomKat Studio. Store bought cupcakes were set inside of paper baking cups, and topped with these darling skull + glitter heart toppers. Can we just talk about these cookies, from Maddi over at Sweet Talk Bake Shoppe?! So aargh-mazing... and delicious too. She captured our Pirate themed Valentine Party perfectly! I love how the pirate treasure map takes you on an adventure to find the red heart. One of my favorite things to do is create a child's party table. I grabbed some red polka dotted fabric from Walmart, and used it as my table cover. Then I just started adding all sorts of fun stuff that I thought my boys would enjoy. I filled a bubble gum machine with small treasures: gold beads, coins, a wooden pirate flag, treat boxes, and red hearts. Each place setting had a black charger, a striped paper plate, mini treat boxes that held their eating utensils, a candy tube filled with swedish fish, and an eye patch! The cute bamboo utensils are from Shindigz! I found the clear plastic tubes over at Hoopla Events! They have the cutest party shop, with all sorts of fun items. When I start planning one of my kid parties, I like to dream up different seating options. I created some seats out of plain car wash buckets, from Walmart. They were the perfect alternative to regular chairs. Here I spray painted the buckets with Rustoleum semi gloss black paint. After my two coats were dry, I hand painted some dotted lines to resemble a treasure map, and added a wooden heart instead of a red X. You can also find these plastic milk bottles from Hoopla Events. I've used them for lots of parties! They're perfect for kid's drinks, and I love that they're easy for little hands to grasp. Right next to the party table, I set out a small treasure chest and filled it with a ship's wheel that I updated with Rustoleum protective enamel spray in sunrise red, a globe, lantern, a skull, and festive balloons! I picked up the pirate balloons from Oriental Trading, and the red balloons with white hearts are from Hoopla Events. Hanging on the inside of the trunk's lid is a darling fabric garland from Lilly Paul Designs. My boys had such a fun time during our Pirate themed Valentine Party! Do you like to throw small holiday celebrations for your family too?